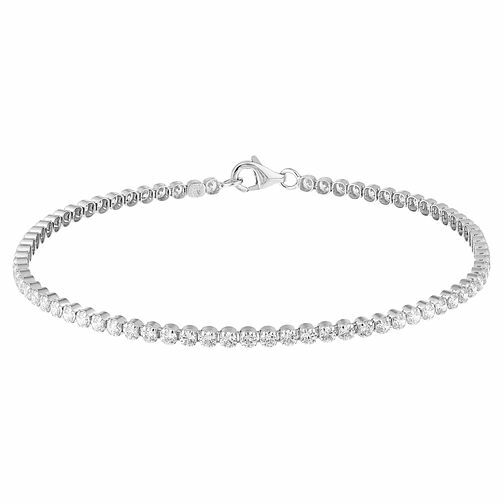 Indulge in sparkle and classic elegance, with this sophisticated sterling silver tennis bracelet. Glittering stones will add glamour to your wardrobe, whatever the occasion. Sterling Silver Stone Set Tennis Bracelet is rated 4.5 out of 5 by 15. Rated 5 out of 5 by Anonymous from Delicate and sophisticated I bought this to wear on my wedding day, I just wanted a subtle sparkle to stop my wrist looking so bare. It’s dainty and pretty, a perfect little bracelet for any occasion. Rated 3 out of 5 by Anonymous from Nice but not easy to put on The bracelet I received was quite short in length so would only be suitable for people with smaller wrists - my wrists are not large just average but it was just a bit too small for me. I found the clasp very difficult to use if fastening myself so had to send it back. It wasn't as sparkly as I'd hoped either.